One of the most iconic American sitcoms of all time — inspired by the same “workplace as a secondary family”-style series such as The Mary Tyler Moore Show and Taxi — television’s genius creators James Burrows, Les Charles, and Glen Charles struck comedy gold with Cheers. Although, as the press release notes, it was ranked dead last during its initial season as its parent network NBC felt that the bottle was decidedly half empty in nearly canceling it, the show grew a loyal and steady following as it continued on. Ultimately the show became part of the quintessential “Must See Thursday” lineup titles that the Peacock network boasted throughout the '80s and ‘90s, with Cheers sandwiched alongside Family Ties and The Cosby Show. Once actor Woody Harrelson became a regular cast-mate as the sweet but dim bartender Woody Boyd, “ratings increased dramatically” as the show picked up momentum throughout the course of eleven seasons. Perpetually ranked in the Nielsen’s Top Ten for eight consecutive seasons once its final season started in 1992, the show — which had raked in the Emmys and Golden Globes — utilized a cinematic approach to each individual episode involving roughly 100 crew members all working with film in lieu of videotape and an emphasis on motion over static master shots by seasoned director James Burrows. 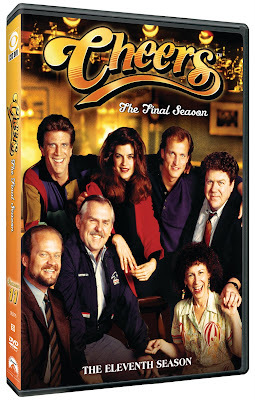 Groundbreaking from the start with plotlines involving addiction, adultery, homosexuality, feminism, and with an underlying emphasis on the blue verses white collar subconscious battle lurking right below the surface during the Reagan and Bush administrations, there’s much more to the folks at Cheers than one may remember, which is immediately evident in its ultimate season. Deeply respecting its audiences — who much like the characters had essentially become participants in a codependent relationship filled with ups and downs with the characters on the series — Cheers ended on a classy and nostalgic note without wrapping things up too neatly (a la Friends) nor taking a mean-spirited approach at a final goodbye as evidenced in the backhanded finale of Seinfeld or Will and Grace (incidentally all other successful series on NBC). Recently released from CBS DVD and Paramount Home Entertainment, the season comes in a slim-packaged, space-saving, four-disc set that’s conveniently the width of a standard DVD. Released in its original 4:3 aspect ratio, the show, which Wikipedia notes was restored once it went into highly successful syndication, still looks and sounds great throughout its twenty-eight episode finale, including the memorable 90-minute conclusion that found the original series heroine, Shelley Long’s Diane Chambers, returning for a terrific twist. While usually final seasons are filled with the climax of the incessant and oft utilized “will they or won’t they” romantic complications or the ultimate surprises of births, marriages, or deaths, Cheers defied expectations right off the bat following up its prior season which found Woody Boyd marrying his wealthy love Kelly Gaines with one of Kirstie Alley’s great monologues regarding a new life plan for her character Rebecca. Vowing that she’s going to become an entirely new woman and one who no longer whines or complains or screws up pretty much everything that comes her way — once she takes a long drag on what she calls her final cigarette — unfortunately Rebecca can’t change her accident prone nature when what’s left of her cigarette burns down most of Sam Malone’s bar. Unable to face Sam (Ted Danson), she confides in Dr. Frasier Crane (Kelsey Grammer) until finally the guilt gets the better of her as Sam faces near financial ruin. Starting with a surprising obstacle Cheers went against the grain during each episode that followed. 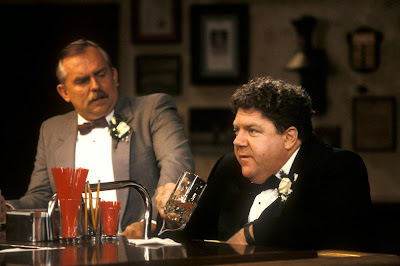 However, it’s a sitcom first and foremost and there are still some memorable classic bits of hilarity throughout, most notably when Norm (George Wendt) is hired as a beer sampler at a local brewery (in an episode directed by John Ratzenberger), Sam battles a Frenchman over who can score the most phone numbers in an America verses France competition as Carla (Rhea Perlman) brings out his trusty “babe kit,” and we learn that Carla’s secretly dating the seafood restaurant-owning upstairs snob when he has a heart attack following her confession that she loves him. One of the strongest arcs during its final season and the best set-up for the superior spin-off that followed — Frasier — finds Cheers’ resident psychiatrist Dr. Frasier Crane experiencing more heartache and anxiety than his patients when he learns that Lillith (Bebe Neuwirth) has fallen in love with another man and has decided to leave both Frasier and their son Frederick to journey with her new beau to live in an eco-pod. 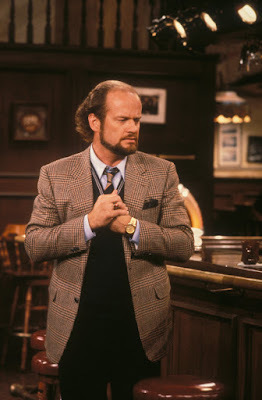 Threatening to jump from Cheers and finding himself so mixed up he nearly winds up sleeping with Rebecca (again playing against our preconceived ideas of what will happen to the bar’s resident cast), Frasier becomes the ideal anchor of the final season. 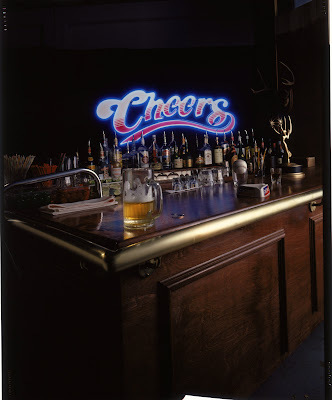 Moreover by growing and changing into something new, he seems to provide the ultimate therapy for the audience that will have to bid farewell to the place “where everybody knows your name” as the show realized it was time to close its doors. Thus, Frasier’s shocking plot made the perfect segue for a series that was ready to move onto to something more socially relevant since the Clinton era made the ideal setting for Frasier’s Seattle based, upper-crust sitcom that again managed to work in some of the classic blue-collar elements of its previous series with actors Peri Gilpin and John Mahoney (both of whom appear in tiny unrelated roles during this final season). And I definitely do grant that the final episode does find a few things wrapped up nicely for certain characters as Rebecca marries someone you’d never expect and Woody is elected as a city official. 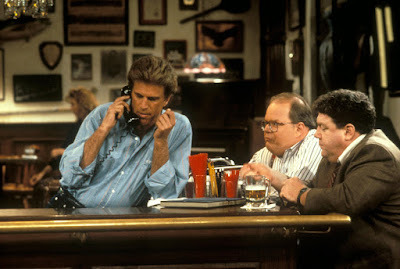 Yet despite that there’s a wonderful twist involving Ted Danson’s character that will no doubt cause one to get a little teary-eyed when he realizes that, in a sense, the ultimate love of his life was none other than Cheers. 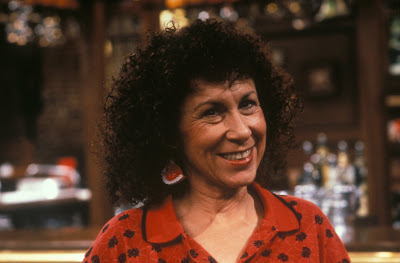 For in the end it was more than just a bar but rather a show that transcended the art of the sitcom and gave everybody a nice, safe place to escape… at least for thirty minutes every Thursday night.